If you need to pay your dues to play the blues, then Scottish guitar player, Andy Gunn has paid them in spades. Born with Haemophilia, Andy was one of the patients affected by blood products contaminated with HIV and Hepatitis C and has campaigned tirelessly to bring justice to his fellow victims. As a teenager, the infections caused by the contaminated blood, played a large part in him falling into alcoholism and addiction, though he has now been in recovery for many years. Indeed, it is not so long ago that he recovered from a second bout of HIV related cancer and yet, somehow he has remained unbowed and has used these trials and tribulations to inform his writing and playing. Inspired by the likes of Muddy waters and Lightin’ Hopkins, Gunn has developed over the years into an articulate and emotional player. He has now completed his 5th album called Too Many Guitars to Give Up Now, a title that came about after being asked how many guitars he owns! Instrumentally, Gunn is well versed in using his many guitars to form a textured, musical narrative behind the lyrics. Vocally, the only comparison I can come up with is a sort of octave lower Neil Young blended with Robert Johnson. A style which is an acquired taste, I guess, but very well worthwhile persevering with as the song structures are strong and the playing is of a high standard. The opener, Misery Blues begins with sublime acoustic before slinky keys join in. Lyrically, I think he is allowed to “have the blues like I never had before”. With the resonating (pun intended) guitar colouring the entire song, it is already my favourite. Let You Go has a ‘cowboy’ feel that you cannot help but tap your foot to. A classic, understated harmonica solo fills it out. A piano heralds in Sorry Mess Blues and begins a slow shuffle punctuated by harmonica and a gentle string bending electric guitar. The solos this time are a rolling bar room blues piano and a totally apposite guitar evoking a laid back, smoke and whisky atmosphere. Back On Song is a plea for normality; “hold on to the melody of our dreams” says it all and with a plaintive guitar and lovely backing vocals from Liz Jones it becomes a warm and gentle piece. Next is yet another slow paced song in Mississippi Ground. Featuring drums properly for the first time it has keys, harmonica and backing vocals in support of a gorgeous semi-acoustic solo. Resonator slide kicks of Battlefield Blues, which develops into a traditional blues composition. Eidyn Shuffle is just that, an instrumental shuffle with all of the players getting a turn at showing their prowess. Andy May wins this hands down with a great organ solo. Eidyn, in case you are wondering, is the ancient (up to the year 638 anyway) name for the city of Edinburgh. Another barroom piano and harmonica take us into Help You Along. A pleasant enough song, but perhaps the weakest here. Back to electric guitar and the slow, but paced Suffering Man’s Blues. More excellent May keys before the Peter Greeney solo. Warm Heart Blue is, at last, a bit faster with a ‘standard’ blues construct. 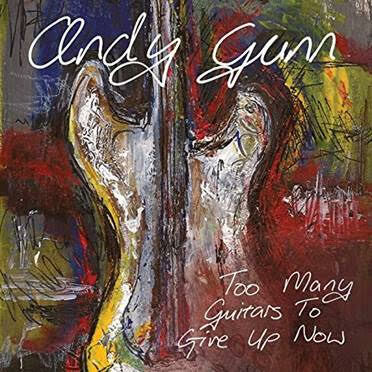 Too Many Guitars is a bit faster again and explains how Gunn was absorbed into the blues. He name-checks Little Richard, Fats Domino and then goes all Chuck Berry on the solo. The final track, Going Home Again, takes the pace back down to end the album on a positive note, with a piano-led journey back home. A damn good album overall, but many may find it too slowly paced throughout; a decent rockier feel to one or two tracks would have lifted the whole up a notch or two. The pace does, however, reflect the lyrical content, and in the right setting is a genuine delight. His band provides sterling backing and contributes hugely to the overall feel of the album. So, here’s to a laid-back night by the fire with the drink of choice in one hand and, if you’re me anyway, a cigarette in the other and the hi-fi high. That is bliss!